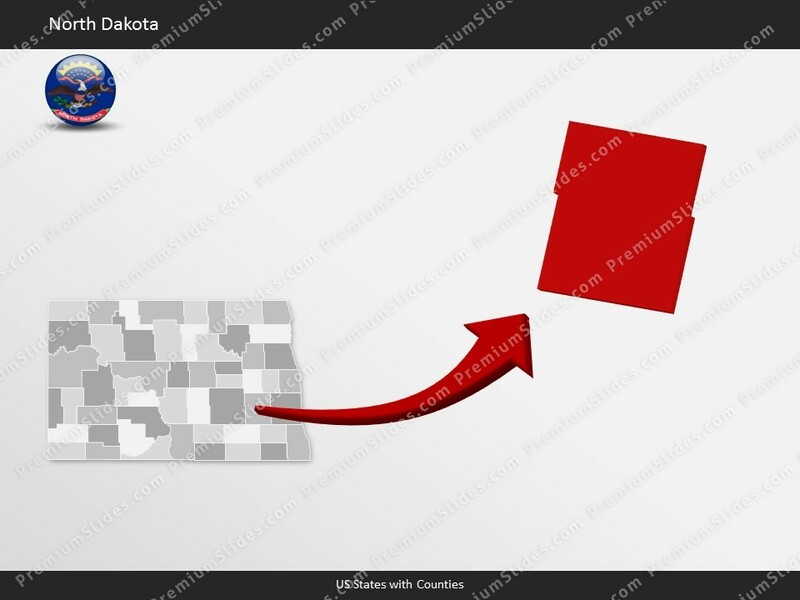 Premium PowerPoint Map of US State North Dakota. This detailed PowerPoint Map Template shows North Dakota counties, county names and biggest cities including the North Dakota state capital. 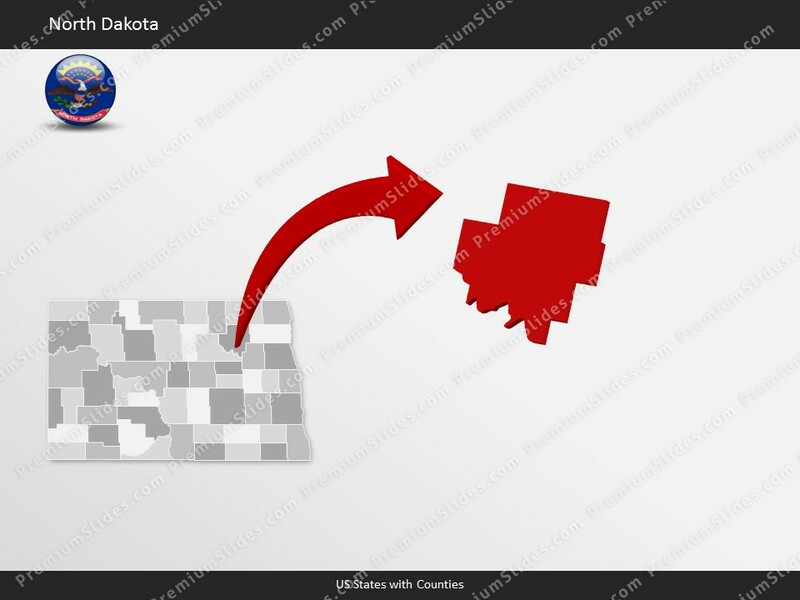 Premium PowerPoint Map of US State North Dakota. This detailed PowerPoint Map Template shows North Dakota counties, county names and biggest cities including the North Dakota state capital. The North Dakota PowerPoint Map is hand drawn and fully editable in size and color. Specific territories can be highlighted easily with just 2 clicks in PowerPoint. 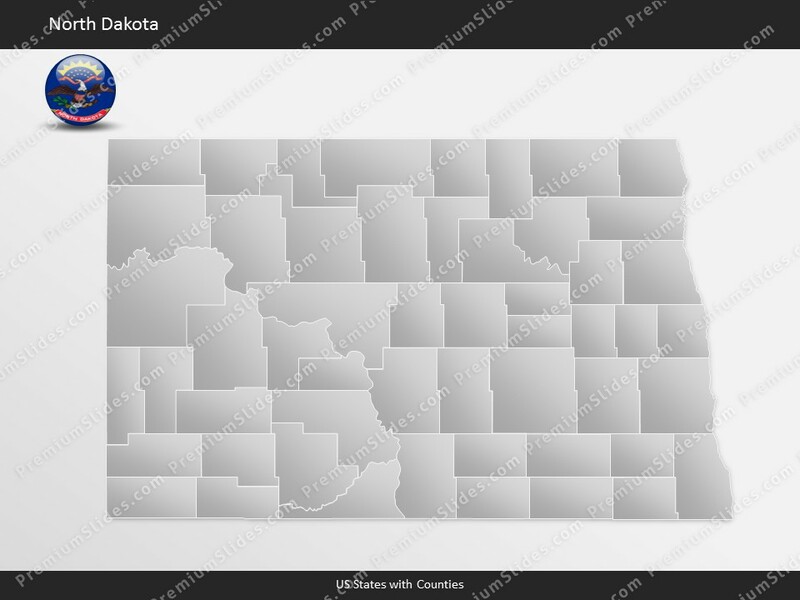 The North Dakota Map Template is a great benefit for showing sales data in this state. Do not wait! 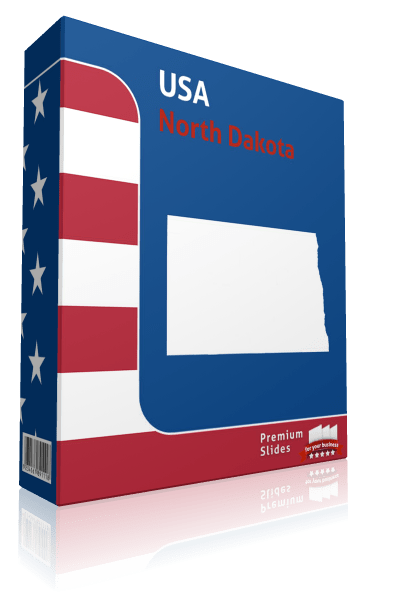 Get this Premium North Dakota Map Template for an unbeatable price today and impress your audience in your next meeting! Facts and information about North Dakota State you can use in your presentation. North Dakota (ND) is also known as the Sioux State; Flickertail State; Peace Garden State; Rough Rider State. The name North Dakota comes from the Sioux tribe, meaning "allies". The date of admission to the Union was on November 2, 1889 out of Dakota Territory (part). It is the 39th state to joining the other constituent entities. The motto of the state is: Liberty and union, now and forever: one and inseparable. The total size of this US State is about 70,698 square miles. Therefore North Dakota ranks in 19th place among all other US States in terms of land area. Actually 69,001 square miles are covered by land and 1,697 square miles are covered by water. The mean elevation is 1,9 feet. North Dakota's highest point is White Butte with a height of 3,506 feet. The lowest place is Red River, which is 750 feet. Its geographic center can be found in Sheridan County, 5 miles southwest of McClusky. North Dakota is bordered by the following states: Minnesota, Montana, South Dakota. In 2015, 756,927 people lived in North Dakota. The majority of people do not live in the capital Bismarck. They live in the largest city Fargo. The residents are called North Dakotan. North Dakota is known for these industries: Food processing, machinery, mining, tourism. North Dakota is significant producer of agricultural products, including Wheat, cattle, barley, sunflowers, milk, sugar beets. North Dakota is part of the region of the the Midwestern United States.